The Forgotten Empire: Can one generation restore Canadian whisky to glory? 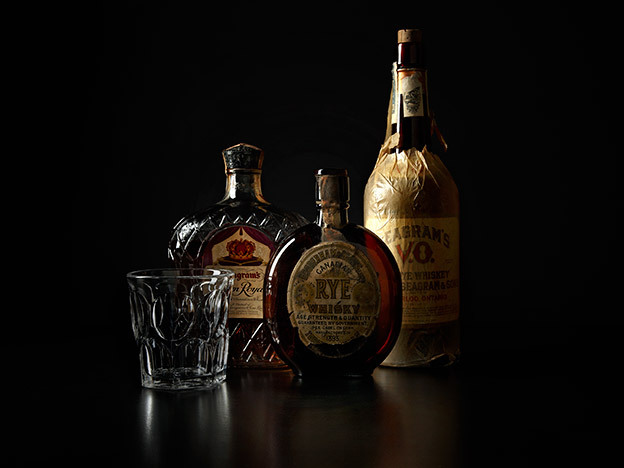 Established in 1858, the Hiram Walker & Sons distillery, located in a part of Windsor, Ontario, once known as Walkerville, produces Canadian whisky brands such as Canadian Club, Gibson’s, and Wiser’s. As we walk to the factory from the Canadian Club Brand Center on a warm June afternoon, Art Jahns, the centre’s archivist and facilities manager, hands me an orange safety vest. After checking in at security, we arrive on the factory floor, which is crowded with steel tanks and hissing, grinding machinery. The factory has a pleasant odour, like warm milk on cornflakes. While Canadian whisky is called rye, its primary ingredient is most often corn, which pours into the top of the distillery building from a nearby granary. The corn, along with smaller portions of rye and barley, is then cleaned, crushed, and hammered. The milled grains go into batch cookers, which help release their starches. From the cooker, the mash is combined with yeast to ferment for seventy-two hours in one of the factory’s three-storey tanks. The viscous beige liquid produced here is known as “distillers’ beer,” and it runs through a device called a column still (which resembles the coils on the back of a refrigerator but on a much larger scale), to separate the alcohol from the fermented mash. The resulting distillate, described both as a neutral spirit and a base whisky, is blended with barley and rye-based flavouring spirits produced in pot stills — smaller onion-shaped chambers that yield a fuller-bodied alcohol. Single malt Scotch, made from malted barley, is crafted entirely in pot stills. This twice-distilled blend, which can be further flavoured with sherry and coloured with caramel, is then cut with water and aged in forty-gallon charred oak barrels. After at least three years, the minimum required by law, the whisky is recut with water to the desired proof and bottled. But since Canadian whisky’s Rat Pack heyday, its reputation has plummeted. “It would not be beyond argument to now call Canadian the forgotten whisky empire,” writes Jim Murray in the 2010 edition of his essential drinking guide, Jim Murray’s Whisky Bible. Within a half century, Canadian rye has gone from being the preferred potable of James Bond — who drank CC, not shaken martinis, in Ian Fleming’s 007 novel Dr. No — to the Canuck-trash sipping drink of Trailer Park Boys’ Jim Lahey, who prefers Alberta Premium. Considered low priced and low class, staid and unimaginative, it’s your dad’s whisky. “There is only so much I’m prepared to drink for my country,” Mordecai Richler once wrote, in reference to Canadian wines during the free trade debate. And when it came to whisky, the novelist who satirized the Bronfman rye barons in Solomon Gursky Was Here preferred Macallan single malt for his personal consumption. But with a generation of bartenders now aspiring to celebrity chef status, and cocktail trends reviving brown spirit–based drinks like Sazeracs and manhattans, rye’s future might well lie in its past. As newly emerging boutique distilleries, attuned to these contemporary drinking realities, expand the boundaries of Canadian whisky, has the time come to revive an old favourite?